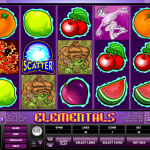 It seems that we can never get enough of fruit themed slots and for that reason Microgaming came up with Elementals. 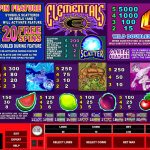 A video slot game that was created back in 2010 and besides the basic cherries and watermelons, just to name some, includes the 4 elements, fire, water, earth and air. All these symbols are represented with a unique icon. Elementals is powered with a wild symbol and 2 scatter symbols each having a different function in this game. Let`s start with the wild which substitutes for all the other symbols except for the other special symbols in order to complete a winning combination. Every win containing a wild symbol will be a subject to a x 2 multiplier and it also has its own values and can bring the jackpot of 5000 coins to you for 5 wilds on an active pay line. 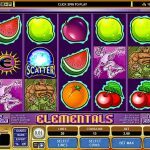 The crystal ball scatter awards with scatter payouts and the big E symbol is the key to the free spins. This symbol appears on the first and the fifth reel and if you land them simultaneously you will receive 20 free spins. What is more, the wins during this feature will be doubled and it is also possible to re-trigger the free spins as well. Microgaming created Elementals and packed it with special features just for you. The game has unique theme which makes is stand out in the crowd. You will definitely be entertained all the time while playing this game and the bonus rounds will keep you thrilled all the time. This is one of those games that you really need to give it a go and see for yourself where your luck will take you. Wouldn’t you love to be entangled in international espionage? then you should consider playing Agent Jane Blonde a 5 reel slot by MicroGaming.